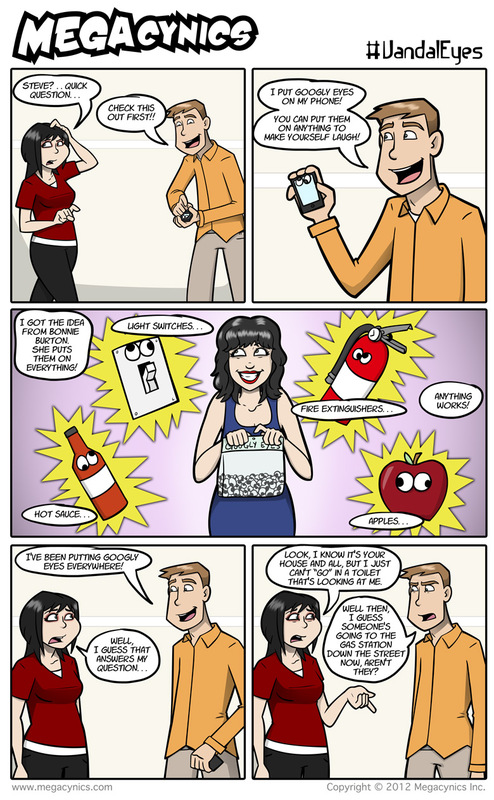 Today's comic features Bonnie Burton of grrl.com, who got me hooked on self-adhesive Googly eyes. You can buy them from a number of sources, such as Archie McPhee. You can stick them on almost anything and it makes stuff look hilarious. We have a photo gallery that we're just getting going, but Bonnie Burton (@bonniegrrl) and her friend Ann Wheaton (@AnneWheaton) are constantly tweeting awesome pictures of googly-eye attacks. Their Twitter feeds are outstanding, and worth following for the googly-eyed pranks alone. For more pics you can also search the hashtag #VandalEyes on Twitter. In fact give it a click right now and see what you find!